Will I buy the cabin/property? The question is asked on the Day of Saturn and in the Hour of Mars. There is no agreement between the lord of the Hour or the Libra ascendant or Lady thereof. The chart is not radical and there is warning of displeasure. With a non-radical chart there is something out of tune or something that doesn�t quite rhyme. There is a need to look at the details of the chart. The querent is signified by the ascendant, it�s Lady Venus and any planet in the first house, which in this case is Mercury who is on the cusp of the ascendant. The querent is a broker (Mercury) and the leader of his own business (Venus in Leo 10th). His Sunsign is Libra � so the chart describes him neatly. The seller is a car salesman who is represented by Aries on the 7th and Mars who is in the sign of his fall on the cusp of the 10th. Mars comes from the opposition of Pluto and anyone who has been following the financial crises would recognize that anyone working within the car sales industry has been in for a tough time the last couple of years. The seller in a difficult situation, may be close to bankrupt, and has to sell one of his properties to save his situation. The property is signified by Capricorn on the cusp of the 4th and it�s ruler Saturn, who is in his own terms of Virgo but yet cadent in the 12th house. Saturn in his own terms shows a property of a fair condition. The 12th house shows a remote and withdrawn location, yet there may be a detriment due to cadency � and my suspicions are raised by the applying opposition with retrograde Uranus in the Pisces 6th. It was impossible for me to come to terms with this configuration and I advised the buyer that there could be something wrong with the wires or pipework, Saturn in Virgo, imposing some necessary renovation. The buyer said that the cabin had no bathroom or water closet and that a tight tank would have to be installed to facilitate these appliances. The owner of the cabin had the property appreciated in 2008 and the value was assumed NOK 1.150.000. The current rate of exchange �1 = NOK 10,-. However, this was before the financial crises had set in and he was offering it on the market for NOK 995.000. Cancer was on the cusp of the 10th house so the price was due to negotiation and change. Considering the Moon�s South node in the 10th together with Mars on the Midheaven the price could do nothing but fall. I noticed that the Moon, Lady of the 10th, was cadent in the 3rd house, hence poorly located, but even more important I observed that she was Void of Course and intercepted. This meant that the price of the property ws incorrectly represented and that the cabin held a secret. I noted that Saturn, Lord of the 4th, and Mercury on the cusp of the ascendant were in mutual reception by exaltation, so I judged that the property would become the querent�s if he wanted it. Yet Mercury was slow of motion in such a way that Mars, signifer of the seller, applied to him by a square though signs of long ascension. This will usually indicate negotiable terms unless both significators are below the horizon. I advised the querent that he should not initiate the purchase but that the seller should come to him and the price move in his direction. On September 8. it was confirmed that the seller had moveed in direction of the buyer and that he was willing to sell the cabin in the price range NOK 850-900.000. The buyer was considering an offer in the range of NOK 800.000, however, having conferred with the prospectus and the local authorities it turned out that the seller had installed water facilities in the cabin yet never delivered an official application. So as the querent discovered, his plans of improving the bathroom were immediately stopped by the cabin�s water facilities being reduced to a bucket of water. The lack of approved water facilities in house does greatly change the value of the property. 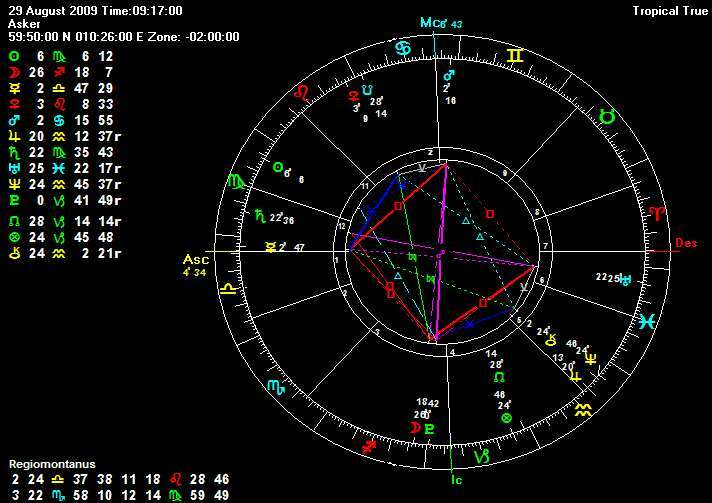 I noticed how the Moon separated from the square of Saturn and lastly the square of the retrograde Uranus in Pisces in the 6th house. This thus showed the sellers tampering with the regulations (also Moon in Sagittarius). Seeing that the Moon was VOC I judged that the price was going nowhere and that as she entered Capricorn, the sign of her detriment, and encountered the conjunction of Pluto before the opposition to Mars, the price was due to be cut further. The client thanked me greatly for my judgement and advice. Very nice discussion and a methodical approach. Yes, I agree this is very neat. I have a question.. why is the 10th house "the price"? Does the 10th have significance over prices generally, so say the price of the ring, or the price of the car, would also be the 10th? Or is the 10th the price in a property purchase only.. maybe because it's the 7th of the 4th.. the contract of the house? Thanks. Sorry if this is available elsewhere, I couldn't find a rationale. CA, CHAP. XXXIII. Of Buying and Selling Lands, Houses, Farmes, &c.
Let the 10th house, a Planet or Planets posited therein, and Lord of that house signifie the Price, that is, Whether it will be sold cheap or deer. This is knowne by the Lord of the 10th, for if he be Angular, Direct, and strong in essentiall Dignities, the price will be high, and the Seller will put it off at deare rates; but if the Lord of the 10th be cadent, retrograde, slow of motion, afflicted, then the price will not rise high. Let the 10th house and the Lord thereof signifie the Profit which may arise by that undertaking.